Our oblong shaped glass vases are perfect for designing office flowers to sit on boardroom table, service area, reception desk or office entrance. 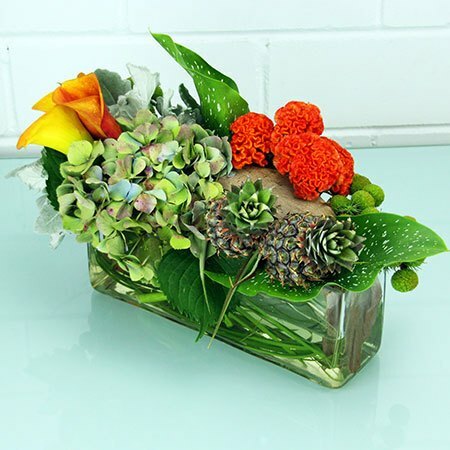 Filled with lush, tropical and classic garden blooms, combined with interesting features such as miniature ornamental pineapples and sculptural leaves, this corporate flower arrangement is stylish and professional. Our florists create these flowers for your office using the freshest in-season blooms available on the day, taking into consideration your office decor and corporate colours. For a free consultation to receive a weekly delivery of flowers to the office, give our team a call on 1800 66 66 46 or email sales@flowersforeveryone.com.au. *Please note: Flowers for Everyone deliver corporate flowers for offices in Sydney metro based on your unique requirements and budget.